Linda lined up her teddy bears on the bed. “All right, teddies. I'm going to go out with Mummy and Daddy. I want you to behave yourselves while I'm gone.” Linda fluffed them up and the shut the bedroom door behind her. The three smaller teddies sat up. “Now we can play with her toys,” Wendy said. “I want to explore the house and see if she has any honey,” Walter said. “Walter, we're teddy bears, not real bears. We don't eat. We just pretend to eat,” Wesley said. When Wendy reached for a pile of blocks to play with, Will pushed her out of the way. “Those are for me to play with, not you. Go and find something else,” Will said. He sat and built a castle out of the blocks. When Walter went to play with the ball, Will pushed him out of the way. Wesley wanted to put the jigsaw puzzle together, but when Will saw him reach for it, he pushed the teddy out of the way. “Oh no you don't. 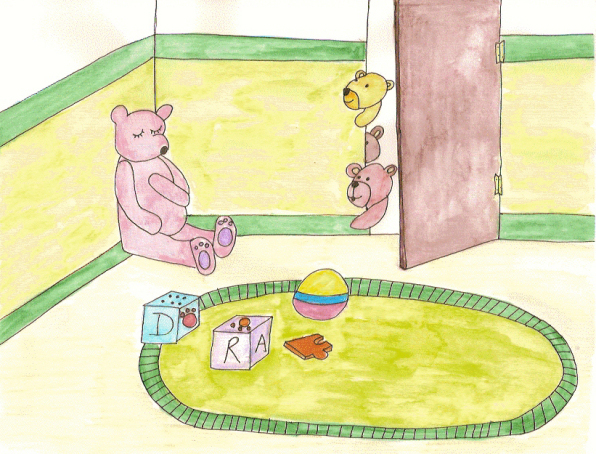 I'm doing the puzzle.” The greedy bear grabbed all the toys and sat in the middle of them. He wouldn't let the other teddies touch them. Walter, Wendy and Wesley decided to go and find something in another room. Wendy opened the door and out they marched, leaving Will with all the toys. Wendy found a ball of knitting yarn and rolled it out all over the house. Walter went into the kitchen and found the cupboard with the pots and pans. He took a wooden spoon out of the drawer and banged on the pots. Wesley spotted a jar full of coins. He opened it and spilled the coins all over the floor. “This is fun,” Wesley said. “Let's go and find out.” Walter left the pots on the floor and ran to the bedroom. They crept into the room and sat on the carpet, playing with the toys while snores erupted from Will's mouth. The front door flew open. “I'm home,” shouted Linda. “Oh no! They're back.” Wesley jumped onto the bed. Wendy and Walter dropped the toys and joined Wesley. Will sat against the wall sleeping. “Mummy, why are the pots and pans on the floor? Who dumped out the jar of coins and someone messed up your knitting wool. Mummy, what's going on?” Linda looked around the house. Will looked at the others. Wendy winked and then felt Linda plop her down in a chair, anxious for the tea party.